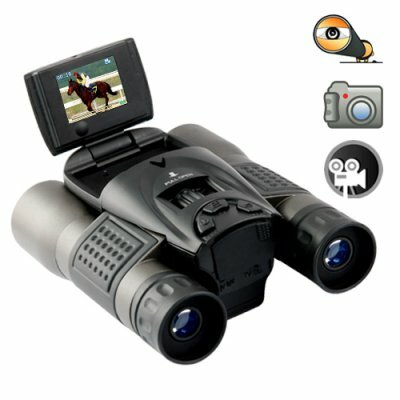 Successfully Added Long Ranger Digital Binoculars with LCD Flip Screen to your Shopping Cart. Presenting the Long Ranger digital binoculars for capturing video and photos. This great new technology DV camera comes with a both direct view and a flip-up 1.5 view screen making surveillance or bird watching a breeze. The Long Ranger Digital Binocular is built for everyone who needs to zoom in close to see what they are viewing (sports events, wilderness scenes, long-range surveillance, etc) and record the video or photos at the same time on an SD card. Similar to the design of the traditional binoculars, this particular binocular comes ready to capture exactly what you are looking at in both video and image format with a simple click of a button. The Long Ranger Digital Binocular is designed to provide users with ease and comfort in their outdoor adventures and hobbies. For even more versatility, the Long Ranger comes with a TV out option allowing for direct playback of what you've recorded on your TV at home or the office. The Long Ranger Digital Binocular is available at a factory direct wholesale price to consumers, resellers and drop shippers alike. Place your order today and experience the great advantages this digital binocular can offer over all other DV Cameras. Proudly brought to you by the leaders in factory direct wholesale electronics, Chinavasion. This digital binocular is not waterproof, and should not be exposed to rain or snow. How far can I see with this digital binoculars with LCD flip screen? This digital binoculars comes with 32x digital zoom, you can see over 150 meters in distance.